Have you heard of K-Pop? Two years ago the answer would almost certainly be no, unless you were living in Korea and other parts of Asia, but today the Korean music genre is increasingly followed the world over, thanks TO its online reach, which just got extended further still. The Korean pop (K-Pop) industry has taken two significant steps towards growing its already impressive online footprint after industry-wide content pages were established on both Facebook and Google+. These moves will help bringing stars, music, news and multimedia to millions of existing and potential new fans across the planet. Social networks and the Internet are opening the world like never before and K-Pop, a genre of pop music from South Korea, is fast becoming an example of the international opportunity that the Web can offer. A K-Pop Hub has been launched on Google+ to give users of the social network an easy and convenient way to keep up with their favourite stars while, in partnership with Facebook, a dedicated (and official) K-Pop Page is now active on the 900 million member strong social network. Korean entertainment firm SM Entertainment launched the Facebook Page that will featuree content from the firm’s artists star, including photos, videos and other multimedia. Updates will be posted in Korean and English, as Asia One reports, making it relevant for overseas followers of K-Pop, as well as those at home. The launch of the Google+ K-Pop hub, and Google’s promotion of the social network in South Korea, had been delayed until the search giant got clearance to launch its mobile app. The app is a crucial addition to Google+’s marketing and reach, given the how smartphone-crazy Korea is – having just passed 50 percent ownership. The hub includes an initial four groups — Beast, SISTAR, After School and INFINITE — but Google is confident it will add more soon. Users that circle the hub can receive all updates from the members bands, with content available in English, Japanese and Korean. As we explained back in February, music stars are playing a key role bringing Internet users from across Asia on to the Google+ service, with Japanese super girl band AKB48 the most notable example to date. While K-Pop’s move to tap into Google+ has been a long time coming, the additional presence on Facebook will further extend the industry’s impressive digital footprint and global influence. Already there is a dedicated K-Pop YouTube page, thanks to an agreement with Google last November, which gives the artists and recording labels greater visibility on the world’s most popular video site, which sees 800 million unique visitors each month. Groups like Girls Generation — managed by SM Entertainment — are leading the charge worldwide. Their video for ‘Gee’, for example, has racked up more than 75 million views since it was posted in 2009. Despite the Korean lyrics, the video has been watched right across the world — primarily in Australia, the Middle East and North America — as YouTube’s own stats below show. The main demographic is young women (13-24 years old) and men aged 35-44, which is typical for girl groups from Korea. Global consumption is a common theme for much of the K-Pop collective on YouTube, and it demonstrates how the Web and YouTube are helping to take the music genre global, and beyond simply just the Korea diaspora overseas. SM Entertainment’s official YouTube channel has more than 500,000 subscribers and, just a day after it launched, the Facebook Page has already accumulated more than 29,000 fans – a number that will surely grow rapidly. It isn’t just online initiatives, as offline activities are breaking new ground too. Further proof of K-Pop’s popularity in the US — and the influence of the Internet — came when YouTube organised a concert neat its Mountain View HQ, which took place on Monday. The gig was set up in partnership with top Korean entertainment broadcaster MBC, and included a series A-list popular stars, such as Girls Generation. Demand was such that free tickets to the show sold out within an hour of being released. Those that couldn’t make it could catch the gig broadcast live on YouTube Presents, becoming the K-Pop event to be showcased there. Given the success, other K-Pop-related broadcasts could well follow soon. Twitter is a slightly different proposition, partly because it is not as popular as Google and Facebook in Korea, but also because it doesn’t lend itself to promoting multimedia quite so effectively. The K-Pop stars themselves are leading the microblogging efforts, and a number of them have accrued massive follower numbers on the service. 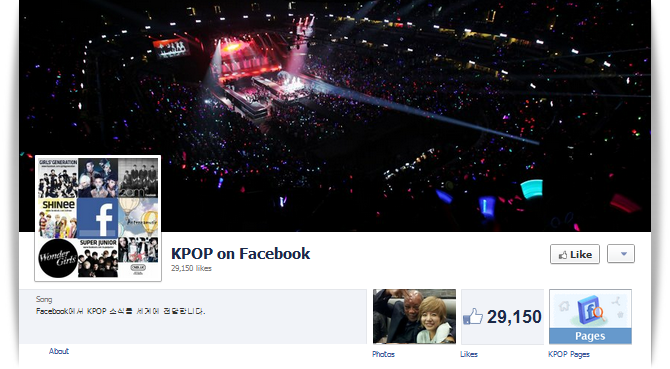 2PM star Nichkhun, for example, engages his 1.2 million followers daily in a mixture of languages to accommodate them. With YouTube, Google+ and Facebook under its belt, Korea’s pop industry has three of the most significant content services on the Web within its digital locker, and looks set to only continue to grow its presence the world over through them, and other Web-based initiatives. For those that are curious about what all the fuss is about, here’s the ‘Gee’ video from Girls Generation.